As a general rule, when I plan vacations to destinations, I don’t typically stay at high-end luxury resorts. I seek out places I think other Americans might not find. Nothing’s really off limits: small hotels, B & B’s, guest houses and yes, even hostels. My family has experienced, and most of the time, enjoyed them all. I love to be spoiled. Who doesn’t? My family and I are lucky enough to have stayed at some absolutely incredible resorts. At Thanksgiving we recharged our batteries at Carmel Valley Ranch, learning about bees and lavender in between hiking the 500 acre playground. At the end of a hustling 10 day adventure in Costa Rica we landed at the JW Marriott Guanacaste Resort & Spa where the only thing that got us out of the largest infinity pool in Central America was a horseback ride on the beach. Both stays created memories that will stick for the rest of our lives. When we land at resorts, it’s for a vacation that is truly meant to be a vacation. 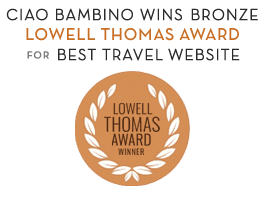 But there are times when we prefer to find alternative, authentic accommodations that work with our budget and allow us to really dig into a destination. Our first family hostel experience was in 2006 in Lausanne, Switzerland. As fabulous as Switzerland is, it is also phenomenally expensive. (Amie’s said it over and over again!) We were trying to keep our budget in check and landed at the Lausanne Guest House & Backpacker. The view of the train tracks are not exactly 5-star, but it had everything else going for it. It was clean, comfortable, quiet and the folks at the front desk were fabulous. Everything from directions to family- friendly restaurants, to helping the tooth fairy make it all the way to Switzerland when my daughter lost her first tooth abroad! Almost six years later she still has the Edelweiss Swiss Army Knife we bought at the GuestHouse in the late hours of the evening. Six months later a fairytale wedding took us to Great Britain. Two trips to Europe in one year meant keeping to a budget was a must, but no easy task in London. Rhodes Hotel was a dream find. A Georgian House in a residential neighborhood, walking distance from Hyde Park and the must-do Diana, Princess of Wales Memorial Playground. Our family room required climbing some stairs, but gave everyone room to stretch out. This time it was my younger daughter who decided the tooth fairy needed to earn some frequent flier miles. The shiny, silver pound coin left under her pillow accompanied her downstairs to breakfast where she proudly showed off the hole in her mouth to hotel owner Chris Crias. Minutes later, out of the kitchen comes his wife Maria with a gooey chocolate crepe, perfect for a little mouth minus a tooth. Travel memories don’t get much better. The Fourth of July took us to France’s Loire Valley for yet another dream wedding. With massive amounts of family commitments filling our days, we needed a place that could provide some much needed family downtime. We found it and so much more at Les Hautes Gatinieres. Owner Jacqueline Gay is a dream come true for a traveling family. The two connecting rooms that serve as her family room are cozy and comfortable but it was the little touches that set her apart. Home cooked, made to order breakfasts. She cooked for my girls like only a grandmother can and usually will. Getting up was a breeze, because the girls looked forward to breakfast and then time to play in Jacqueline’s backyard with her dog Appy. After just one night, they knew what sofa to look under for some of Appy’s favorite toys. When my daughter’s clothes somehow got dropped in a pool during a family picnic, I hung them in the shower to drip dry. Jacqueline found them when she came in to clean the room and had them washed, dried and folded by bedtime. We were supposed to go to Disneyland, but when a Kayak search turned up amazing plane tickets to Spain, we went for it. One of my less organized trips, but also one of our best family adventures. 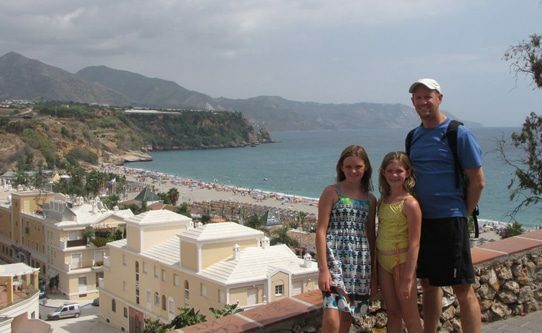 Nerja, on Spain’s South Coast, was one of our favorite stops I think in part because we got a great taste of local life. We stayed at Hostal Lorca. With the feel more of a home than a hostal, its owners Rick and Femma and their children welcome visitors from around the world. They told us exactly where they take their kids, to shop, eat and play. Every recommendation was right on the money. And for my girls the time to play in the backyard pool with local kids was a traveling experience in itself. There’s a kitchen area off the hostal back yard open for anyone to use and a fridge full of drinks you take and pay for using the honor system. There’s a lesson we don’t get to show our kids in practice much anymore. Casa Blues is the house I would want to own if I could live in Arcos de la Frontera. Since I can’t, I’m especially glad Nick does. Originally from London, he was a wonderful host, supplying great touring suggestions and even letting the girls stretch out with homework in the dining room. Casa Blues has just a handful of guest rooms and an apartment. The rooms were spotless and we loved waking up to the stunning view every morning. The goats in the distance were charming as well! But maybe the best part, the quiet roof terrace. We ate tapas on the terrace and just about every other meal there during our stay. An added bonus, Nick has a friendly cat named Sam who just kind of showed up one day and decided to stay. Needless to say, he’s a kid magnet. The smaller the accommodations, often means less amenities. What can you live without? Often much more than you think. It’s a tricky balance especially for traveling families, but over the years I’ve discovered it’s the personal touches and interactions that stand out, not the size of the bathroom. An interesting post, Switzerland is a really great country to travel around. I have been to Switzerland a couple of times and as someone who is into photography, there is always so much to photograph. I particularly like the Valais Canton area. Do check out some of my Swiss photos on my blog if you have time. Thanks!